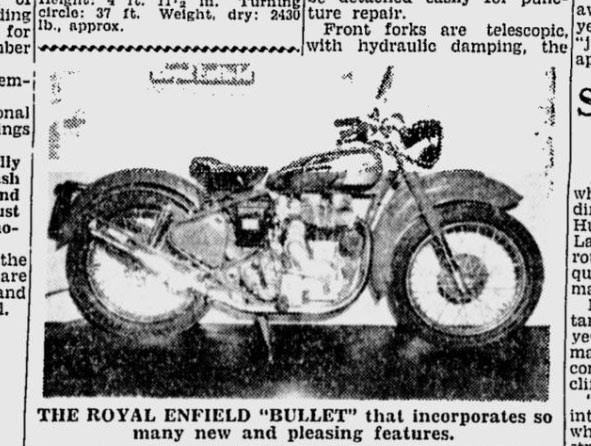 The Royal Enfield Bullet, reviewed in 1950. The legendary motorcycle engineer and writer Phil Irving reviewed the then brand new Royal Enfield Bullet for The Age newspaper of Melbourne, Australia on Aug. 3, 1950. By that time, Irving already had worked for Vinicent, Velocette and Associated Motor Cycles, designing motors, suspensions and sketching entire motorcycle designs. He wrote a technical column in Motor Cycling magazine and would go on to write "Tuning for Speed" and other books. He died in 1992, still president of the Vincent HRD Owners Club. His 1950 review found the 350cc Bullet tractable and comfortable, with its plonking motor and spring frame. Brakes were only average, but he found the distinctive neutral finder "a boon at crossings." Click on this link to read Phil Irving's review of the Bullet. Irving didn't complain about the motorcycle's looks, although the massive front fender shown in the accompanying photo spoils the appearance for me. The engine was not broken in, so speed runs were limited, but Irving judged acceleration from 20-50 mph to take about 12 seconds, with top speed probably 72 mph.